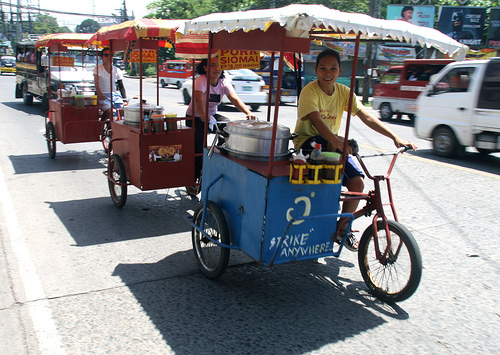 These are mobile pork siomai vendors negotiating through J. P. Laurel Avenue in Davao City, on their way to the different parts of the city to sell the popular Chinese delicacy. Siomai, also called dumplings, is a type of traditional Chinese dish consisting mainly of grounded meat to a paste of either pork, or beef, chopped shrimp, among others, seasoned with extenders such as green peas, carrots, wrapped in very thin, round sheet of unleavened dough called wonton wrappers. It is cooked either steamed or pan-fried resulting in a crispy exterior. It is normally dipped in soy sauce and squeezed calamansi with an oily, chili (siling labuyo) and garlic mix. In Philippine food stalls and fast food restaurants, siomai is usually eaten through the use of toothpicks to facilitate handling, or with rice using spoon and fork. Siomai used to be available only in Chinese restaurants but now it is one of the favorite street foods in the city.